When the plan to remove Condit Dam on Washington's White Salmon River was first announced in 1999, government officials and environmentalists alike heralded it as a landmark example of how economics and environmental protection could work in tandem. In 1989, PacifiCorp, the Portland-based company that owns Condit Dam, was faced with renewing the federal license that allows it to operate the 89-year-old structure. Because Condit generates a relatively small amount of power, PacifiCorp realized it would be cheaper to simply tear it out than it would be to build the fish ladders the Federal Energy Regulatory Commission (FERC) would require for relicensing. Ten years later, PacifiCorp, the federal government, the state of Washington, environmental groups and Northwestern Indian tribes brokered a deal. Anglers, tribes and environmentalists would get a free-flowing river, and PacifiCorp would get a relatively cheap fix for an outdated and inefficient hydropower project. Before the ink on the signatures was dry, the Clinton administration glowingly touted the deal as a watershed in consensus, a victory for all involved (HCN, 10/11/99: Dooming a dam saves dollars). Experience on other rivers, such as the Snake and the Elwha, has shown how difficult dam removal can be, but Condit seemed closer to coming down than any other Northwest dam (HCN, 9/24/01: River of dreams). In July, FERC released an environmental impact statement naming dam breaching as its "preferred alternative" for Condit. But in the past few months, the proposal to breach the 125-foot dam - which, if destroyed, would be the highest dam ever removed in the U.S. - has hit a few unexpected snags. The biggest problem is the 2.4 million cubic yards of sediment that have backed up behind the dam for nearly a century - sediment that would wash into the river if PacifiCorp blew an 18-foot hole in the dam, as planned. This fall, the state announced it cannot endorse the "blow and go" strategy or issue two critical permits until FERC and PacifiCorp have studied how the sediments and debris will be removed, and what the impact will be on downstream stretches of the river. Opponents of dam removal have seized upon the state's concerns. According to Aaron Kilgore, president of the White Salmon Steelheaders Club, the removal will do more harm than good for endangered salmon and steelhead. "There's more spawning area from the dam to the (river) mouth than there is from the lake to the falls," which are upstream of the dam and will stop migrating fish in the dam's absence, says Kilgore. "So if you blow that thing out, you destroy more salmon beds than you were opening up." He also wonders about the effect of sediments on the river's water temperature, and the possible presence of pesticides and other chemicals in the silt. Regardless of whether the silts are dredged, officials in Skamania and Klickitat counties, who represent residents living along the reservoir, say they will oppose the removal. They say blowing up the dam will destroy the reservoir's renowned trout fishery, which provides a steady source of tourist revenue. Even formerly gung-ho dam busters seem to be getting cold feet. In an April letter to FERC, Rep. Brian Baird, D-Ore. - a prominent supporter of Condit's removal in the late 1990s - expressed concerns about the loss of electricity generated by the dam and the impact of returning salmon and steelhead on the region's trout fishery. PacifiCorp warns that the cost of dredging the sediments would eliminate the company's economic incentive to breach the dam. The 1999 agreement capped PacifiCorp's contribution at $17.5 million. If dredging were thrown into the mix, proponents of dam removal would either have to find another funding source or renegotiate the deal. Nonetheless, the company is pushing ahead with the state permit process, arguing that the sediments will naturally flush downriver in just a few years. "We had no illusions that it would be easy to get all the required permits," says PacifiCorp spokesman Dave Kvamme. "We knew the state of Washington was going to take a hard look at the removal plan." Despite the setbacks, supporters of dam removal are confident that the permit problems will be smoothed out, and that by the fall of 2006, the White Salmon River will again flow wild. "Removing the dam makes the most sense from both an ecological and an economic perspective," says Brett Swift of the Portland office of American Rivers, an environmental group. 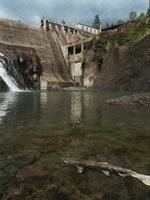 While the initial cost might be higher than expected, tearing down Condit Dam would not only restore the natural ecosystem, it would improve recreation opportunities that bring money to the region. "We really can't let the short-term impacts stop the long-term restoration." Pending the biological opinions of both the U.S. Fish and Wildlife Service and the National Marine Fisheries Service, FERC will make its decision on Condit next spring. Aaron Kilgore, White Salmon River Steelheaders Club, 509/493-1159.